ATV/OHV use on public lands is one of the most contentious issues facing land managers. In 2005, the U.S. Forest Service published a rule in the Federal Register requiring the designation of roads, trails, and areas that are open to motor vehicle use. Motor vehicles will be prohibited off the designated system of routes. To implement the rule, each Forest Service administrative unit or Ranger District will need to designate roads, trails, and areas open to motor vehicle use. The travel management planning process to identify ATV/OHV routes promises to be "lively" for federal officials as interest groups and the members of the general public express their perspectives. Of course, the above ATV compatability map image is very coarse scale and ATV trail and routing decisions need to be made on a much finer scale. 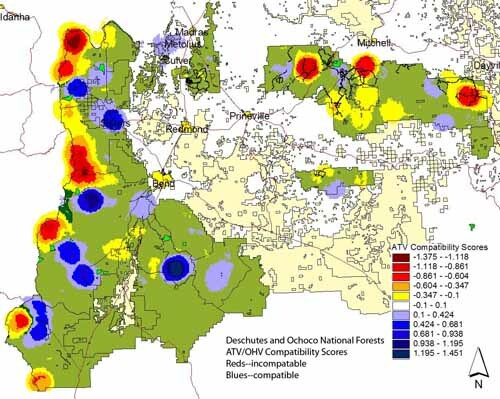 Nonetheless, landscape value mapping can provide a reasonable "first cut" in identifying compatible and incompatible areas on the forest. For more information, contact Greg Brown.